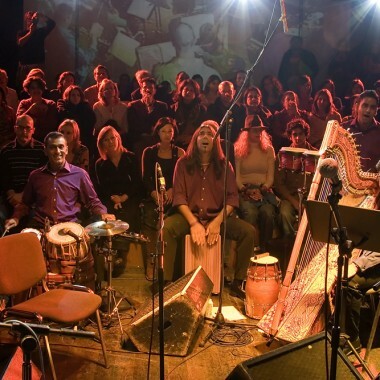 The Ku-Da-Mix Orchestra seeks to represent and celebrate diversity and harmony through musical and theatrical expression, combining Western classical, jazz and Indian traditional music. 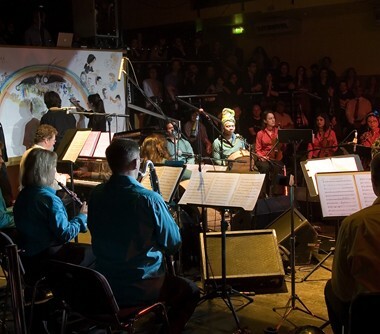 The Ku-Da-Mix Orchestra seeks to represent and celebrate diversity and harmony through musical and theatrical expression, combining Western classical, jazz and Indian traditional music. 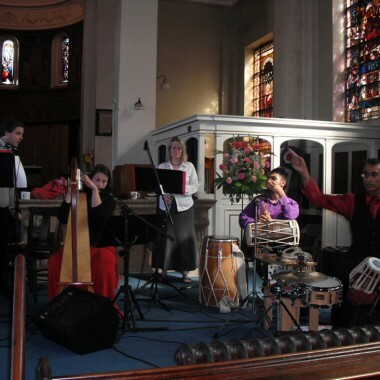 Original compositions draw on Eastern and Western sources, with performers from African, Indian, Chinese, Latin American, Armenian and Western classical backgrounds, in a fusion of sound and colour. Kuljit Bhamra and David White are the co-Founders and Artistic Directors of Ku-Da-Mix – a new multicultural orchestra. We develop, compose and arrange original work for the ensemble which awakens curiosity and both surprises and entertains audiences. We introduce them to a new world of sounds from both familiar and little-known instruments and cultures. We explore environmental, visual and theatrical possibilities, which add new dimensions to the live musical experience. Having completed a very successful sell-out London launch at the Scala we are undertaking a national tour in 2008, with the ultimate intention to tour worldwide. In this age of video, surround sound and multi-media, how can we use space, light, images, design and movement in imaginative ways in a concert environment? How can we challenge inherited and traditional orchestral codes of practice and transform the expectations of both performers and audiences? How can we take music to the heart of communities who would not normally travel to traditional concert venues, but may consider attending a performance in, for example, their local disused bus station or cinema? How do we engage with audiences in a way that draws them into a shared discovery of a space and encourages them to look afresh at their local environment? Since inception, Kuljit and David have met and created musical pieces with musicians from a variety of backgrounds and cultures. Together with the orchestra, we have recorded a CD which will soon be released on KEDA Records. The orchestra is organic and constantly evolving, input from new members changing the palette as they bring their particular cultures and experiences into our mix. In addition to the above (many of whom are internationally recognised performers and soloists in their own right! ), from time to time Ku-Da-Mix work with featured soloists such as Andy Shepherd, Zoe Rahman and Kathryn Tickell. The project is attracting keen interest from the media and music journalists. In addition, the process of the formation of the band has been filmed with a view to creating a documentary in the future. 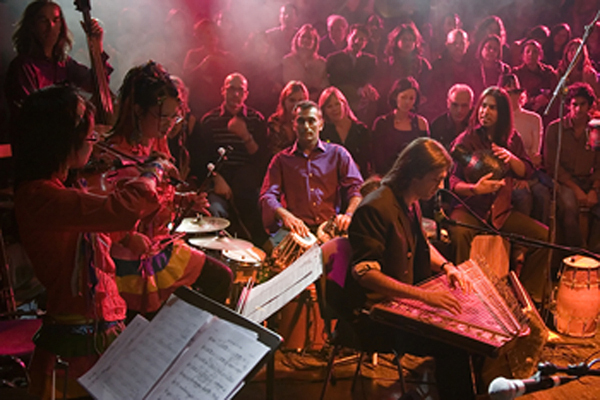 During 2008/09 Ku-Da-Mix undertook a successful Arts Council funded tour. They appeared at a number of high profile festivals and participated in an educational outreach programme with schools in Milton Keynes, culminating in a performance at The Stables in Wavendon. A selection of testimonials are shown below. “I worked with Kuljit Bhamra during my time as a consultant for spnm, of which he was Artistic Director, as well as with him as the Featured Artist at the 2009 Salisbury International Arts Festival. Kuljit is a rare musician/producer/composer, because he brings both an exceptionally strong artist as well as audience focus to his work, and he does this with incredible ease. He is an excellent collaborator, happy and excited at engaging with a world of styles, ever-curious and open, which makes him great to work, securing consistently carefully honed and strong work. Given the quality, breadth and depth of his collaborations and work, ranging across Bhangra, film scores, classical tabla, jazz and much more, Kuljit’s work deserves to be more widely seen.